Whether you’re a young business setting up shop or you’re an established, sellout attraction, competition is fierce when you’re marketing in the destination sector. The pressure to target the right kinds of people, generate a buzz, and then encourage those people through your door is massive. Without forward thinking, your marketing will fall by the wayside. What is your competition doing? What are they likely to do? How are they marketing themselves? 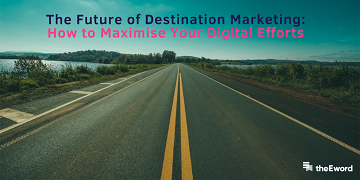 Our article covers these kind of questions (and more) to give you the lowdown on the state of destination marketing in the coming years. To varying degrees, user-generated content has been used in the destination sector – just not to great effect. Over the next few years, providers need to get better at capitalising on UGC. Customer reviews are great, but they’re not the be-all-and-end-all! We predict that destination providers will be using a lot more video content, whether in the form of Facebook videos, Facebook Live, or Instagram Stories. You can also make use of user’s content with social quizzes, surveys, and testimonials. Let your customers speak for you, and you’ll be onto a winner. This is something we’ve touched on before. When we talk about the ‘authentic experience’, we refer to the act of selling an experience, rather than the venue in which that experience is held (as goes the title of our blog on the matter). Stay with us. This abstract concept is best boiled down to the kind of emotions that your destination wants to evoke. Awe? Excitement? Horror? This is called emotional advertising, and it’s the best way to ensure that your destination strikes a chord with your audience. The right chord, that is. As more providers feel the need to distinguish themselves from the rest, you’ll see a renewed focus on emotional advertising. It begins by knowing what your customers enjoy so much when they visit you. We’ve all become a lot more knowledgeable when it comes to living greener lives, and the years ahead of us will see more of the same. In the destination sector – and across others – there is an increasing need for businesses to not only appear environmentally minded, but to put their money where their mouths are. It’s like corporate social responsibility, and without jumping on the back of ‘doing your bit for the environment’ too much, it’s something that more businesses in the destination sector need to do. This is because many of today’s consumers are interested in eco-friendly attractions. To meet this demand, more providers need to face environmental issues head-on, and they need to speak up about what they are doing to help. Give your visitors a taste of your whole attraction in the palms of their hands! With a handy and informative resource like an app, you make visiting your destination much easier. From finding directions to ordering online tickets (another environmental win – paperless! ), an app is the ultimate marketing material that your visitors can engage with. Give us a second to bang the drum of virtual reality (we’re surely not the first to include it in an article such as this), but if there’s a sector that’s perfect for this new technology, it’s definitely destination. You could give prospective visitors a test-ride of your new rollercoaster, or your new venue. Virtual reality in the destination sector has so many opportunities, and you’ll reap the benefits if you use it correctly. If you’d like to take advantage of the above methods but are unsure where to start, you’ve come to the right place. We love working with bright, forward-thinking businesses, and we can ensure that your marketing is intelligent, ahead of the curve, and ahead of its time. As we’ve said, the destination sector is highly competitive. Make sure you’re on top of your game with our free guide: ‘Destination Marketing: How to Use Digital Marketing to Sell More Tickets This Summer’. In the meantime, call us on 0161 848 4300, or fill in an enquiry form here. Alternatively, you can also book a call in with our director Kleon, who is more than happy to talk through your goals.